A quick and easy way to make nicely shaped yo-yo's in minutes! 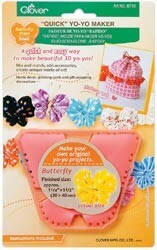 These yo-yo templates are your perfect tool for embellishing paper craft projects, home decor and ready-to-wear. Easy step-by-step instructions are included.